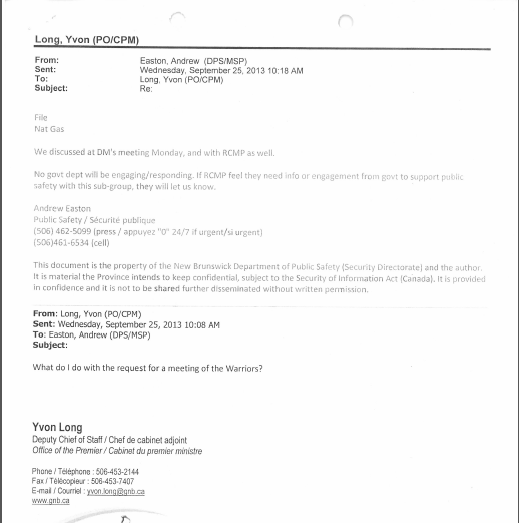 Prior to any blockade, prior to any traffic stoppage, prior to any narrative of violence, and prior to any raid, documents show the Mi'kmaq Warrior Society requested a meeting with the Premier's Office in mid-September 2013, to "discuss Shale Gas and the treatment of indigenous peoples." 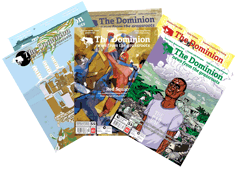 KJIPUKTUK (Halifax) -- Through an investigation into the New Brunswick provincial archives, the Halifax Media Co-op has obtained a range of documents that shed light upon heretofore unexplored events concerning the government's response to anti-shale gas activities in 2013. 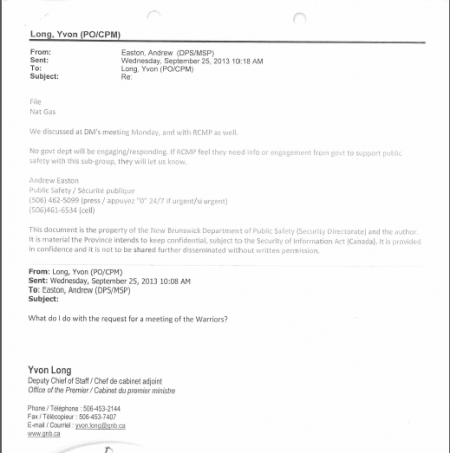 In particular, these documents relate to meetings – or the lack of meetings – between the provincial government and the various groups that comprised the core of anti-shale gas activists. What the documents demonstrate is that some groups were 'legitimized' by the provincial government, in that they were given 'face time' to meet with then-provincial premier David Alward. Conversely, the government appears to have had an expressed policy of isolating, and thus 'delegitimizing', other aspects of the anti-shale gas movement, in particular the Mi'kmaq Warrior Society. That the Warrior Society was the most dynamic, treaty-based, aspect of the anti-shale gas movement in New Brunswick by mid-2013 – and thus most likely able to bring into question the legitimacy of the Alward government's 'right to rule' – does not appear to have been lost upon provincial policy makers and their hesitancy to meet with the group. Treaties signed in Canada's Maritimes provinces do not relinquish title from First Nations peoples, and while other environmental groups within the anti-shale gas movement in New Brunswick had at least a precursory understanding of the implications of these treaties and were prepared to lend their voices to their defence, it was the Warrior Society who actually best attempted to utilize these treaties to the advantage of the movement in the moment, in 'real time' situations. Readers will remember, for example, that several members of the Warrior Society requested negotiating assistance from the Canadian Armed Forces (CAF), on two occasions, against the Royal Canadian Mounted Police (RCMP). These requests, which were ultimately rebuffed by the CAF, were nonetheless based on the understanding that under the Treaty of 1752, the Mi'kmaq nation had a right to an honourable representative of the Crown with whom to conduct negotiations. Documents show that it was the perception of the Warrior Society that the RCMP, through their actions during 2013, which included several arguably 'culturally inappropriate' arrests of First Nations activists, had 'dishonoured' themselves and had thus excused themselves as a representative of the Crown with whom negotiations were possible. In directing the Warrior Society back to the RCMP, who would eventually raid a protest encampment and arrest 40 people, the CAF was following a pattern of response that would become all too familiar. As to the documents now in hand, internal emails from former premier Alward's office show that on September 18, 2013, a representative from the Warrior Society requested a meeting with the premier's office. This request to the premier's office would have taken place six days after the second failed attempt by the Warrior Society to secure military assistance, under treaty, in negotiating services against the RCMP. Once again, we see the Warrior Society attempt, still relatively early in the events of 2013, to secure assistance in coming to a peaceful resolution to protest activities. And once again, we see a potential resolution quashed by a redirection to the RCMP, the very organization that the Warrior Society was seeking assistance against. There are, to be sure, a variety of arguments that one might use to justify the Premier's Office's denial of the requested meeting. The Premier's Office, is, of course, a busy department with many items on its agenda. Meeting with any random protest group who requests an hour of time is not necessarily done as a matter of course. On the other hand, the Premier, along with then-Minister of Energy Craig Leonard, then-Minister of Transportation and Infrastructure Claude Williams, then Minister of Public Safety Bruce Northrup and a variety of Deputy Ministers, did meet with representatives of a variety of interest groups on October 6, 2013, in Moncton, New Brunswick. While the Warrior Society was notably not invited to this meeting, interest groups were indeed given one hour of the government's time to hear their concerns over shale gas. While this process of 'meetings for some but not for others' arguably served the 'divide and conquer' narrative which often becomes prevalent during protest activities, make no mistake; the concerns of the representatives of interest groups present at the October 6 meeting do not appear to have been taken at all seriously by the government. Minutes taken at the meeting suggest that so little interest was paid to whatever concerns the representatives were raising with the government, that their names were not even spelled correctly. “Next speaker was Wilema (surname unknown),” likely refers to Kent County, New Brunswick-based, activist Willi Nolan. “Next speaker was Anne (surname unknown of an interest group),” likely refers to Ann Pohl, then of the environmental group 'Upriver Environment Watch'. “Next speaker was causian (sic) man (name unknown),” likely refers to Mike McKinley, then of the environmental group 'Our Environment, Our Choice'. Although meeting with the provincial government might be interpreted as being better than being shut out of meeting with the provincial government, what actually happens at these meetings is the matter of real importance. Here, it would appear that the actual influence of these 'legitimized' environmental groups within the context of this meeting was entirely negligible. If anything, their being granted access to actually speak with their governmental representatives was likely related to their willingness to ally themselves – and in turn grant leadership 'legitimacy' of on the ground anti-shale gas activities - with the Indian Act representatives of Elsipogtog First Nation. While a philosophical schism between the Warrior Society and Indian Act leadership might have existed leading up to this meeting, one might argue it was only further exacerbated – and the treaty-based approach to resolution further 'delegitimized' - by this process of granting selective attendance. If anything, the 'real' meetings between the Premier's Office and Elsipogtog First Nation leadership would take place in the days following October 6, 2013; meetings which no interest groups would be invited to. One might also argue that the Premier's Office would not meet with the Warrior Society because the Society had been identified as some kind of 'radical' element within the otherwise peaceful (read: complacent?) protest movement. This narrative, of a splinter group that was putting the rest of the anti-shale gas movement in jeopardy, gained serious traction within the provincial government's 'spin cycle' as October 2013 wore on and a Warrior Society-led encampment blockaded millions of dollars of shale gas exploration equipment. Indeed, as Indian Act management of the October encampment spiralled out of control, this spin arguably went so far as to portray the Warrior Society as a radical element that the anti-shale gas movement itself needed saving from. Adherents to this argument, should, however, bear the all-important element of time in mind when shaping their conclusions regarding the Premier's Office's decision not to meet with the Warrior Society. Sequentially, the request for a meeting between the Warrior Society and the Premier's Office took place on September 18, 2013. At this point, there was a lull in 'on the ground' activity against shale gas exploration in New Brunswick. SWN, the company responsible for the exploration work, had taken a 'summer break' and would only physically return to attempt more work at the end of September. The public narrative for not meeting with the Warrior Society, be it because they were responsible for blocking a New Brunswick highway, or because they were violent, or whatever, had not yet been crafted, quite simply because it did not yet exist in time. If anything, one must consider that while exploration for shale gas was on hiatus during mid-September, 2013, the Premier's Office, along with the RCMP, were hard at work determining, in advance, who would be 'legitimized' in the anti-shale gas movement and who would be cast aside.